Each of the many full-day training workshops below occur in the days before or after a two-day Predictive Analytics World conference. Click one of the bullet items just above for information about a PAW conference, or click through below for more details about each of the individual training workshops listed in this email message. Join your peers at the leading conference covering deployed machine learning – and select from stellar full-day training workshop, including two on deep learning. A quick introduction to the topics of design thinking and data strategy based on numerous real-world examples and practical exercises. At the end of the day, you’ll be able to independently develop and evaluate data strategies and apply the canvas tools Data Strategy, Data Landscape, and Analytics Maturity with your team. A use-case and demo-based guideline on how to draw most value from data science for the shop floor. At the end of the day, you’ll be able to independently conceptualize data-driven use cases for your organization, understand the steps to bring those cases to life, and know how to assess the value they bring for your company. This 2.5-hour workshop launches your tenure as a user of R, the well-known open-source platform for data analysis. This one-day session surveys standard and advanced methods for predictive modeling (aka machine learning). 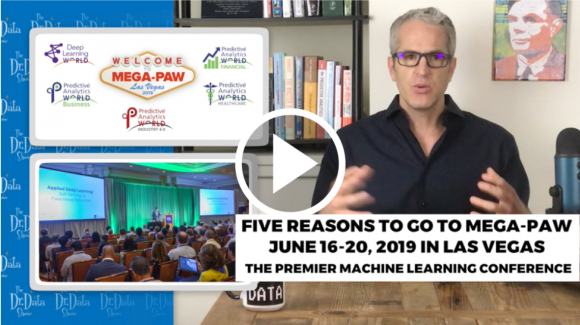 You will learn the tremendous value of learning from data, how to create valuable predictive models with machine learning for your business and the best practices, with real-world stories of what happens when things go wrong. You will explore deep neural classification, LSTM time series analysis, convolutional image classification, advanced data clustering, bandit algorithms, and reinforcement learning. During this workshop, you will gain hands-on experience deploying deep learning on Google’s TPUs (Tensor Processing Units). This workshop will cover the practical considerations for using predictive analytics in your organization through the six stages in the predictive modeling process: Business Understanding, Data Understanding, Data Preparation, Modeling, Evaluation, Deployment. Use the code KDNUGGETS for a 15% discount on your Predictive Analytics World ticket.